As you can read, they were both born on September 19th 1600, married on September 19th, had 12 children and then both died within 5 hours of each other on their joint 80th birthday on September 19th 1680. Now that's an impressive 'coincidence' - if it can be considered that. 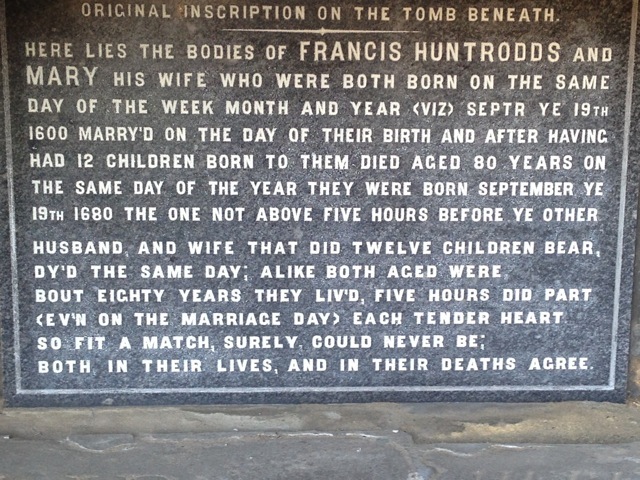 After all, they presumably chose to marry, and when to marry, so the really odd thing is when they died. But was there plague in Whitby in 1680? Did they have an accident? They must have been local characters, having the same birthday and being so old. A modern equivalent is the wonderful couple Joyce and Ron Pulsford who were both 80 on 08.08.08. But they survived their birthday. Nothing is more common with Infants than to dye on the day of their Nativity, to behold the worldly Hours and but the Fractions thereof; and even to perish before their Nativity in the hidden World of the Womb, and before their good Angel is conceived to undertake them. But in Persons who out-live many Years, and when there are no less than three hundred sixty five days to determine their Lives in every Year; that the first day should make the last, that the Tail of the Snake should return into its Mouth precisely at that time, and they should wind up upon the day of their Nativity, is indeed a remarkable Coincidence, which tho Astrology hath taken witty pains to salve, yet hath it been very wary in making Predictions of it. Note the alchemical references to the Ouroboros. So maybe the preponderance of deaths on birthdays is simply due to registrations of babies who die soon after birth? But even though Sir Thomas thought it a 'remarkable Coincidence' if an adult did die on their birthday, this is exactly what he did on 19th October 1682, his 77th birthday. And just 2 years after the Huntrodds died.